Scuba MK - SCUBA MK IS ONE OF THE LEADING SCUBA DIVING SCHOOLS IN MILTON KEYNES AND BUCKINGHAMSHIRE - COME DIVE WITH US. Immerse School Diving - Based in Telford in Shropshire, Immerse School of Diving is a professional scuba diving training school servicing the Midlands. Our focus is on making scuba diving comfortable, safe, and most importantly lots of fun! SCUBATeks - One Life, Dive It! Stafford Sub Aqua Club - Our active diving club of around 50 members, is affiliated to the BSAC (British Sub Aqua Club). We offer a full range of training, from novice to advanced divers, using a 2m pool, various inland dive sites and the sea. Searobin SSI Samui Dive Center - Searobin SSI Samui Dive Center offers a full range of private SSI & PADI scuba diving courses and diving tours tailored to meet your individual needs. Cardiff Scuba Limited - Cardiff Scuba Limited - South Wales' Premier 5 Star Dive Resort - Specialising in PADI and TDI Training - Organising Trips both in the UK and Abroad. Diving Thailand - Dive the Koh Samui Archipelago with Thailand's first PADI Career Development Centre. 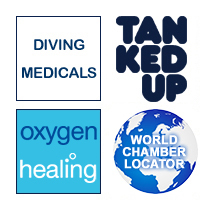 Tanked Up Magazine - The official website for Tanked Up Magazine provides divers with scuba diving blogs, trip reports, club night events, cartoons, dive medicine info and much more. Travelling diver - Diving guides, site information, maps, log books and much more!